Whether you have a wine business or need storage space for your freshly made wine, a EuroCave wine cooler could be the right investment for you. What makes EuroCave different is the technology that creates an environment similar to a wine cellar inside the refrigerator. The downside of EuroCave is certainly the price. Because a EuroCave wine fridge may be too expensive for homeowners, we focused not only on identifying the best cellar from the manufacturer but also on finding the best alternatives. If you’re in a hurry, click on the links in the table below to check our top picks. 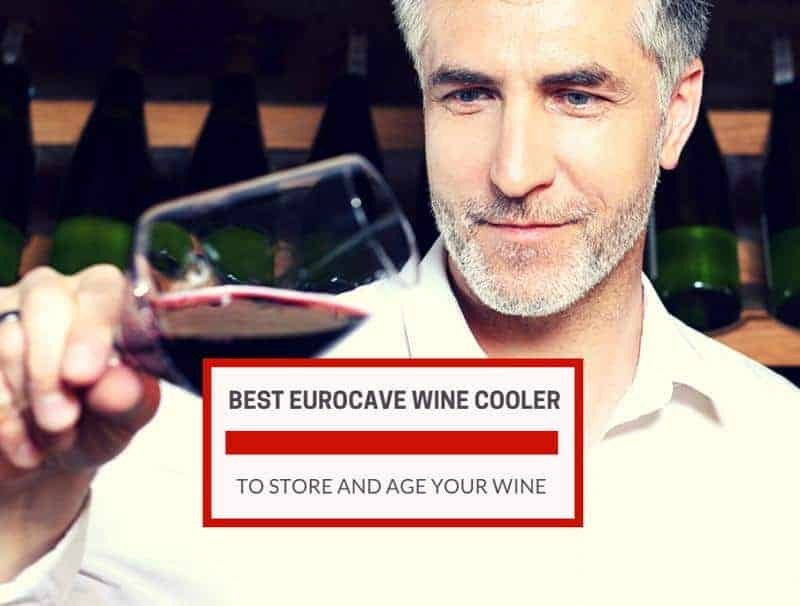 Why Invest in a EuroCave Wine Cooler? If you're pushed for time then you can take a quick look at the EuroCave models that we recommend in the table below. We've also added a few alternatives if the price tag puts you off. To find out more, check out our EuroCave reviews that follow. Manufactured in France, EuroCave was born as an innovative solution to stock and age wine at home. Intended as an appliance that allows wine lovers to make the most out of their wine, EuroCave wine refrigerators are designed to enhance the beverage, keeping it in cellar-like conditions indefinitely. But quality and innovation costs money. That’s why many homeowners are wondering why to invest in a EuroCave cellar when there are dozens of alternatives out there. Here are a handful of reasons why you need a EuroCave in your life. Designed to recreate cellar-like conditions in your home, EuroCave might be the answer for all wine aficionados looking for the perfect storage solution. More than your average wine refrigerator, WineCave is an electronic wine cabinet intended to keep wine at storage – not serving – temperature. The brand manufactures over 500 models of wine cabinets and cellar conditioners. Although different, all of the wine cabinets have a few things in common. As a French brand, EuroCave cares for its image and holds an Origine France Garantie certificate which guarantees that all products are 100% made in France. This is important because all products made in France have to comply with severe European safety regulations. Furthermore, France is one of the main wine producers in the world and supposedly, they know how to preserve wine in optimal conditions over time. Because all components are manufactured in the same place, the brand can also guarantee the highest quality standards for each product. A nice trait is that almost all products are customizable to fit the customer’s needs. A feature that sets EuroCave apart is the innovative air circulation system that ensures a continuous flow from top to bottom, creating a balanced environment for the bottles. The air flow control also boasts a natural air ventilation system fitted with charcoal filters. This ventilation system is designed to control humidity not by creating it but by preserving it inside the cabinet. As a result, the refrigerator unit can be used indefinitely without developing a bad smell or mold. A small drawback is that you’ll have to replace the filters at least once a year. However, the process is simple and the filters are not expensive. An important difference between EuroCave and the other wine coolers is the thickness and structure of the walls. EuroCave is famous for its 5cm (2 inches) thick walls on most models that are the equivalent of a 9-foot thick concrete cellar wall. Superior models boast even thicker walls that improve the interior environment. This allows the appliance to maintain a steady temperature and constant humidity while minimizing the compressor triggering. What this means is a lower energy consumption and higher efficiency in preserving your wine. An element all wine coolers lack is a heating element. At a first glance, this component is useless. But if you’re focusing on wine preservation rather than beverage cooling, you’ll understand why a heating element is important. All wine has to be stored at a constant temperature, which in a cellar stands in the 55°F range. Storage temperature is different than serving temperature that differs from wine to wine, and the purpose of EuroCave is to store not chill your bottles. The heating element, therefore, ensures the temperature is constant by preventing it from dropping too low under the minimum threshold, which usually is 50°F. Another great feature of EuroCave is the temperature range. Most models have single temperature zones with a range between 48°F and 59°F. Again, this may seem less versatile but considering the appliance is built to preserve and store wine, the temperature range is more than generous. We live in a technological world and love apps. And EuroCave cellars come with one. The app doesn’t connect to your cellar, but it gives you to the possibility to organize a virtual cellar with your favorite wines, benefit from advice about your wine collection, schedule a tasting calendar, share information with friends, and more. The app is intuitive and fun to use. This wine learning tool can teach you how to best preserve your bottles and more. These are only a few of the benefits of EuroCave. Since these wine coolers are designed to preserve wine, we’ve selected two of the most popular models with a capacity above 150 bottles. If none of these appliances convinces you, have a look at the three alternatives proposed. Also, don’t forget to consult our more detailed wine coolers article if you’re looking for a different solution. These are the EuroCave refrigerators that we recommend over all others. See what we think about them and why. With a capacity of up to 200 wine bottles, the Artevino II by EuroCave is an outstanding appliance designed to reproduce the conditions of a natural cellar. Thanks to the advanced technology used, the Artevino II is the ideal appliance for an enthusiast winemaker who has limited space to preserve the bottles. This wine cabinet boasts updated temperature controls and a single temperature zone environment that preserves whites and allow reds to mature in optimal conditions. The cabinet comes with 7 solid beech universal shelves that can accommodate various styles of bottles, including Champagne, Bordeaux, and Burgundy bottles. The maximum capacity of the cooler will, therefore, depend on the shelf configuration and size of the bottles. The overall dimensions of the cabinet are 27x72x27.25 inches and the unit has a freestanding design. Another thing we like is the security lock that allows you to keep the wine collection safe. The shelf configuration is flexible and allows to position the bottles for storage, sliding or presentation. This makes the unit ideal for a wine business, although this appliance integrates with success into a kitchen. Air circulation control: the unit automatically heats or cools the air to maintain an ideal temperature and humidity. Electromechanical regulation: the temperature settings are easy to regulate from an intuitive digital display and the unit is cooled by a compressor system. Warranty: the product comes with a 5-year warranty for the compressor and 2-year warranty for parts and labor. Low vibrations: despite being an electromechanical unit, the motor produces low vibrations that won’t disturb bottle sediment. The actual capacity in most configurations is around 140 bottles. You can only use full capacity by removing some shelves and stacking up bottles. Love the Artevino’s features but need a bigger capacity? The Artevino Double could be the solution. 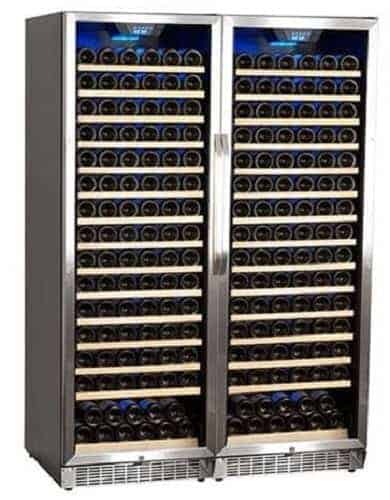 This exceptional wine cooler has a capacity of about 400 bottles, depending on shelf configuration and size of the bottles. While the stated capacity is hard to achieve in most situation, the unit can still store up to 380 bottles effortlessly, regardless of the bottle’s shape and size. The shelves can be arranged to store or display your collection, and they can even slide out for easier access to wine. Like the Artevino II, the double unit has a single temperature zone with a temperature range between 48°F and 59°F. Cooled by an electromechanical motor, the cabinet is quiet and virtually vibration-free. This means more peace of mind and no impact on the sediment. The advanced air circulation system also keeps the humidity inside the enclosed environment, reproducing the conditions of a natural cellar. Thanks to an exceptional electromechanical element, the unit can be placed even in poorly ventilated environments such as a basement or garage. Unique elements: this wine cooler boasts unique elements that help eliminate vibration and noise. The unit is very quiet. Capacity: EuroCave Double has a stated capacity of 400 bottles; in reality, the unit can effortlessly accommodate up to 380 bottles. Full capacity can be reached if the bottles are stacked. Configuration: whether you want to install the unit in your home or in your business, you’ll be able to arrange the shelves to preserve or display your bottles. Lockable: keeping your valuable bottles away from unauthorized access is easy; the wine cabinet comes with a secure locking system. The unit is very expensive. Yet, the quality pays off. If the EuroCave price tags put you off then here are some awesome alternatives! If the price or capacity of our selected EuroCave wine coolers set you off, Ivation 18-Bottle is a great alternative to consider. This unit is perfect for the wine lovers who have just started their wine collection and boasts thermoelectric technology that is whisper-quiet and vibration-free. Ivation wine cooler is designed to keep all wine at a constant temperature, ideally in the range of 55°F. The unit presents itself as a freestanding wine cooler that tends to reproduce wine cellar conditions. Compared to the EuroCave cabinets, Ivation has a poorer humidity control though. However, the manufacturer insulated this unit with solid polyurethane heavy foam and tempered smoked doors that maintain humidity inside the cooler. This still prevents the cork from drying out keeping the wine in good conditions. Like EuroCave, Ivation has a single temperature zone with temperatures that range between 54°F and 64°F. Similar to most thermoelectric units, this wine cooler has difficulties in maintaining a constant temperature and the cooling power is influenced by the environmental temperature. 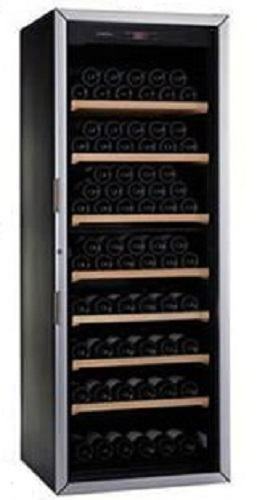 Capacity: this wine cooler is ideal for those who have just started their wine collection. The 18-bottle capacity is ideal for most households. Design: this unit boasts a sleek design with an exterior digital control panel and LCD display. 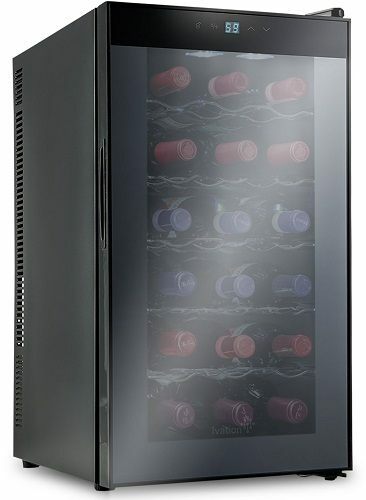 The black finish with smoked tempered glass door enhances the beauty of this wine cooler. Whisper-quiet: the thermoelectric technology is very quiet and the unit produces no vibrations. This ensures the wine sediment is undisturbed. Satisfaction guarantee: the product comes with a 100% satisfaction guarantee which enables you to ask for a refund or replacement should you be unhappy with the purchase. Stated capacity refers to using standard Bordeaux bottles. Capacity is quite limiting if you want to store larger bottles. Allavino FlexCount 172 is all about versatility. The unit has a 172-bottle capacity, it comes with 14 total shelves, and the maximum capacity is only affected by larger bottles such as Champagne or Pinot. This storage unit is ideal for all wine lovers who look for a more budget-friendly alternative to EuroCave Artevino II. This electromechanical refrigerator boasts a dual-zone temperature control with an upper zone set between 40°F and 55°F and a lower zone with a temperature range between 55°F and 65°F. This versatile solution allows you to preserve all wines at 55°F or bring reds and whites to serving temperature as needed. The only limitation to this is that you can’t actually set both zones at the same temperature. The lower zone has to be set at least 4 degrees higher than the upper zone, which is quite limiting. However, you could reach a compromise by storing whites and 53°F and whites at 57°F. Apart from this, the unit presents itself as a sleek wine cabinet with a stylish all-black interior enhanced by innovative features such as a cool blue LED lighting and built-in versatility. Innovative shelf design: FlexCount shelves are thin enough to maximize storage space but strong enough to support bulk storage. 12 shelves have a capacity of 11 bottles each, while 2 shelves can hold 20 bottles each. Sophisticated details: the all-black interior enhances the design of the unit while the cool blue LED light creates a focal point on your wines. Choice: if the interior is all black, you can choose between a black or stainless trim on the door. Just match the style with the design of your interior. Built-in versatility: with no compressor to keep cool, this thermoelectric unit can be installed as freestanding or built-in. The environmental temperature influences the cooling capability of this unit. 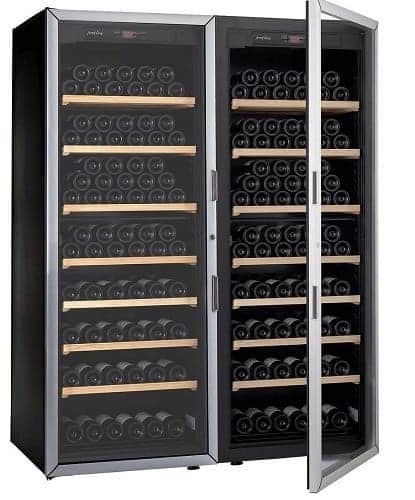 A budget-savvy alternative to the EuroCave’s Artevino Double is Edgestar 332-bottle built-in wine cellar. Similar to EuroCave’s Double, this unit boasts a side-by-side design. An important difference and a big plus for the Edgestar unit is the freestanding and built-in capability. Another interesting thing is that the double unit consists of two single units hinged together. This helps you arrange them in any kitchen configuration you like. You can use each unit separately or reverse the door on one unit to create an attractive French style. Each unit measures 69.5x23.44x26.75 inches, and the product is ideal for both amateur and professional collections. Like EuroCave, Edgestar uses electromechanical technology but here, EuroCave wins. Edgestar has a single zone temperature control with a temperature range between 40°F and 65°F, but the unit is quite noisy and vibrations could disturb bottle sediment. All in all, however, this is an exceptional unit to consider if you don’t want to break the bank. Versatility: ideal for amateur and professional wine collectors, this unit boasts built-in and free-standing capabilities. Auto defrost: the unit has a great management of the temperature and boasts an auto defrost function. Carbon filter: similar to EuroCave, this unit maintains a certain humidity inside the cabinet thanks to an excellent air circulation. The cooler comes with a replaceable carbon filter. Contemporary design: the unit has a sleek contemporary design with classic wood-style shelves and an attractive stainless steel trim. Shelf configuration: this wine cooler comes with slide-out wood-trimmed wire shelves that can be removed if necessary. Considering the suitability for both residential and commercial settings, our favorite EuroCave wine cooler is the Artevino II. This outstanding appliance reproduces the conditions of a natural cellar and provides plenty of space in which to start and grow a collection. A display style allows you to showcase the bottles. Other shelf configurations include sliding and horizontal preserving. The unit has a capacity of up to 200 wine bottles, although full capacity can only be reached with standard bottles that are stacked up. Drawbacks apart, the unit is cooled by an electromechanical motor; the single temperature zone allows you to preserve both reds and whites. Maintaining a constant temperature between 48°F and 65°F, this unit also boasts an exceptional humidity control by keeping moisture trapped inside rather than producing it. This eliminates awkward odors, keeping the wines in the best conditions. Then, we like the extended warranty that covers the labor and part for 2 years and the compressor for 5 years. The cooler is also whisper-quiet and the low level of vibration doesn’t disturb wine sediment. Yes, this EuroCave wine cooler is expensive. But in the end, quality pays off!